Happy Anniversary to me! It’s been one year since the launch of freshnessgf.com and I’m so delighted with the end result – an online food journal full of recipes, stories, and photos. Honestly, my biggest thrill is when people tell me that they a) checked out my site b) tried a recipe and/or c) shared the site with their friends. It’s so totally humbling and gratifying that I fist pump every time. 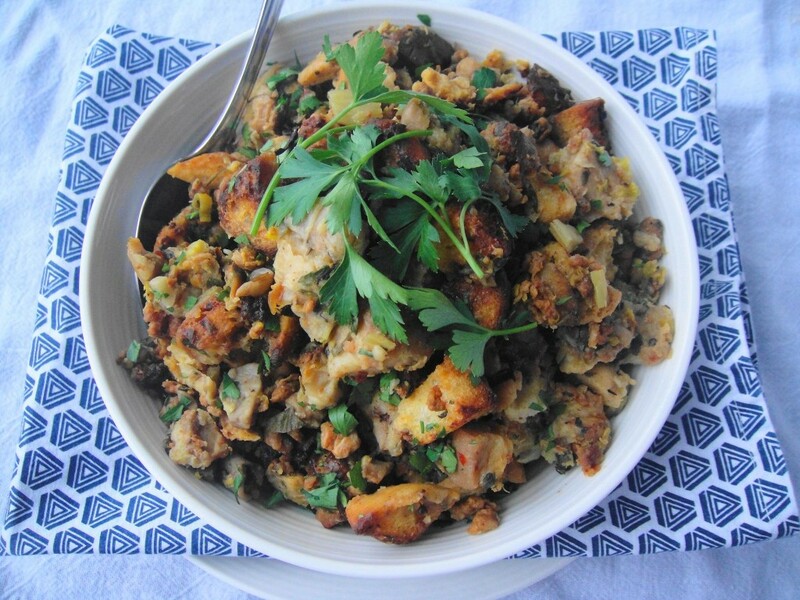 In honour of this milestone, I thought I’d share one of my fave celebration recipes, stuffing with roast chicken. Notice that the stuffing is the main event here and the chicken, although delicious, is an accompaniment to its carb-tastic counterpart. My aunts make the most amazing stuffing, something our family gets to devour only three holidays a year – Easter, Thanksgiving, Christmas. They also make the most moist, juicy turkey known to man and their holiday spreads are legendary for requiring a big appetite and some stretchy pants (this past Easter, there were no less than 20 separate dishes being served up – scroll to the end to see). Since going gluten-free, I’ve had to give up on my aunt’s savoury stuffing but craving that distinct delicious comfort food, I ended up creating my own version. Now typically stuffing gets stuffed inside the cavity of a turkey, which is great for feeding large crowds lots of turkey and not so much stuffing. 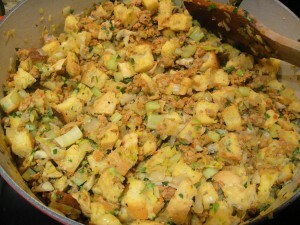 However, my version involves a lot of stuffing and a single chicken for roasting. The chicken is enough to feed three or four, but I make enough stuffing to feed quite an army. You can totally modify the recipe to make half the amount, but be warned, you’ll wish you had more leftover stuffing afterwards. 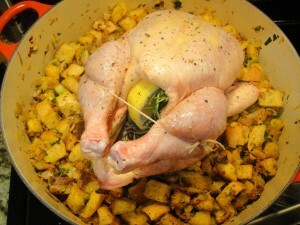 So the way to get all that stuffing is to layer the prepared stuffing underneath the chicken which gets roasted on top. So it’s inside out stuffing. 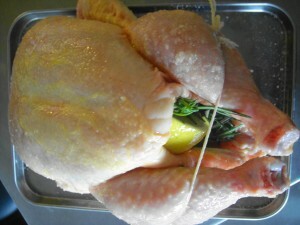 I got the idea from Martha Stewart – to see a picture of the finished chicken and stuffing click here. I always make this when company is over and I keep forgetting to photograph it before I slice and serve. What makes this stuffing superior to traditional stuffing is how some parts get nicely crispy and browned, while other parts get squishy and moist from the juices of the chicken. Is your mouth-watering yet? Mine is just thinking about it. One trick I picked up from my aunts is to make sure to use lots of onions. 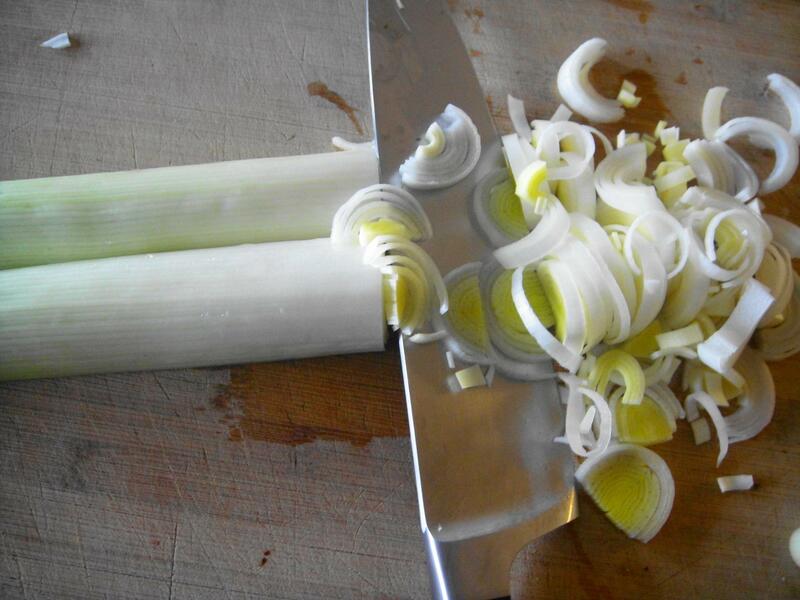 In my version, I use a combo of white onions, leeks, and garlic. Also, I use chicken sausage instead of pork, and I pick different flavours depending on the palettes of my guests. Heat loving friends got spicy Italian while D’s family got a milder honey garlic version. Either way, you can’t really go wrong. This recipe takes longer than most of my other posts, but it’s still easy to whip up. Just saute the sausage and veggies, add the bread crumbs and stock, plop the chicken on top and stick it in the oven. While it’s roasting away, the aroma fills the house with the smell of a celebration, and in my case, it usually involves a glass of wine or bubbly. 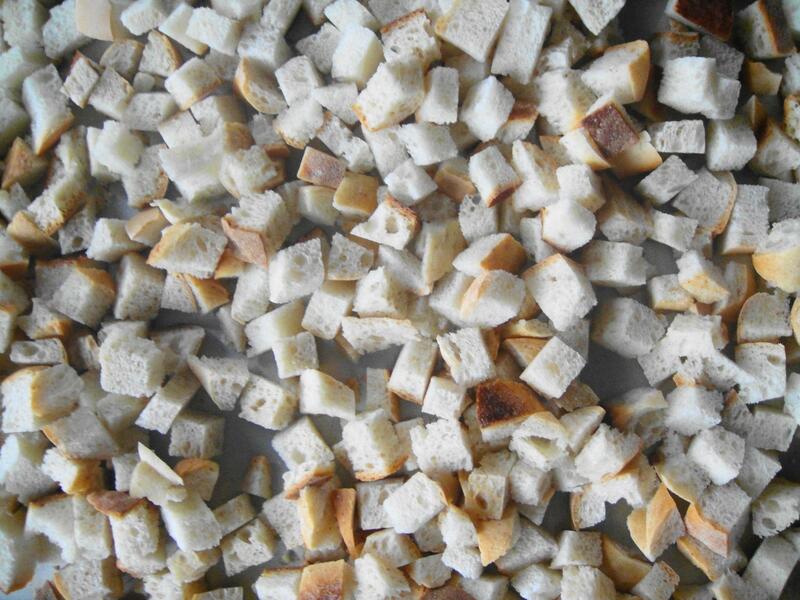 Make stuffing. Heat pan over medium-high heat and add 1 teaspoon of canola oil. 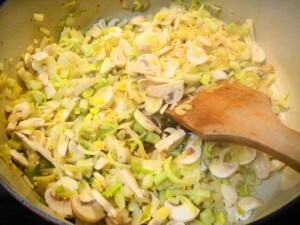 Add sausage meat and sauté, mixing and breaking up pieces with a wooden spoon. Continue to cook until slightly browned and cooked through. 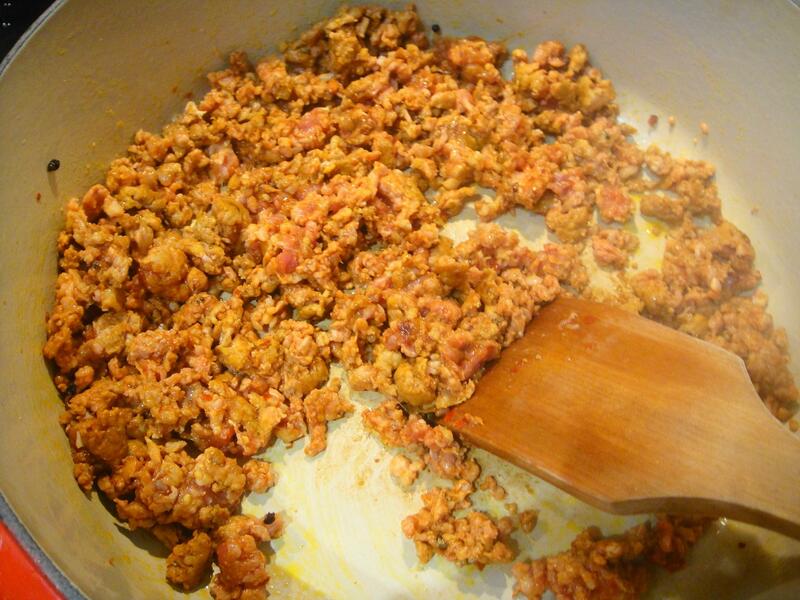 Remove sausage meat with a slotted spoon and set aside. 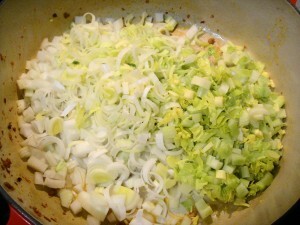 Add 1 tablespoon of canola oil to the pan and add leeks, onion, and celery. 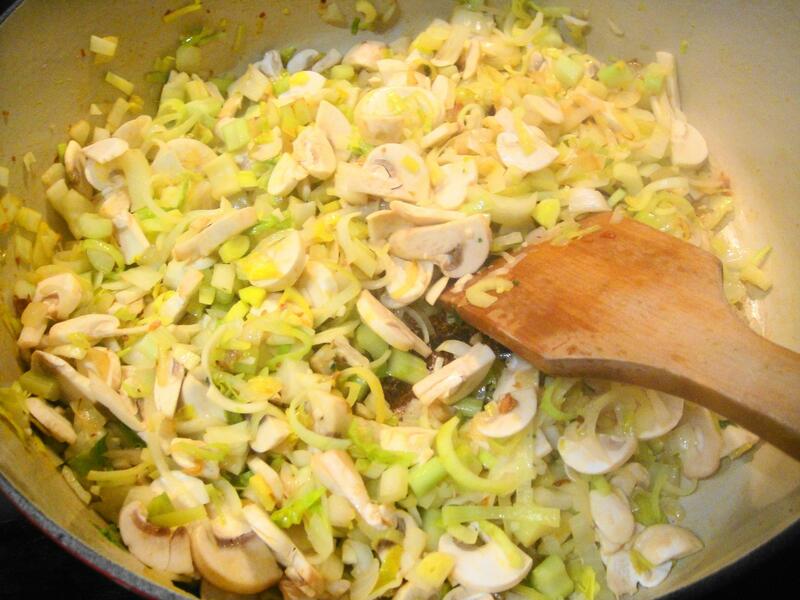 Saute for 2 minutes, or until ingredients start to soften. 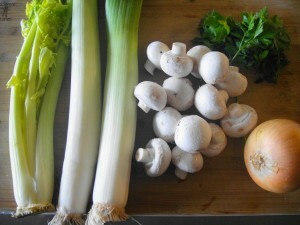 Add mushrooms and garlic and sauté for another 5 minutes. 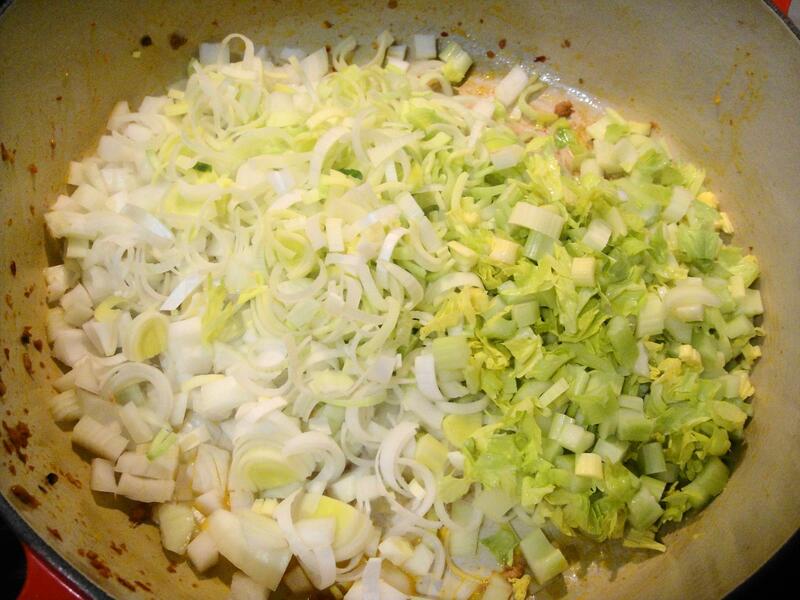 Add 1 cup of chicken stock and scrape brown bits off bottom of the pan. Remove from heat. Add cooked sausage meat, parsley, dried herbs, pepper and bread to mixture. 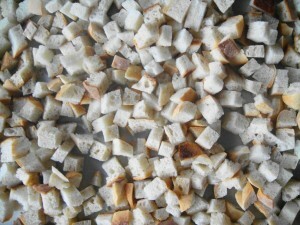 Stir well to combine – each cube of bread should be moistened by stuffing mixture (add more stock if it looks too dry). Set aside. Prepare chicken. Preheat oven to 450 degrees. Place chicken, breast side up, on top of stuffing and tuck the wings underneath. Tie legs together with kitchen twine. Pat the chicken dry with paper towel. Rub skin with olive oil and season with salt and pepper. Stuff inside cavity of chicken with lemon, garlic, and rosemary. Roast for 30 minutes. Rotate the pan and continue to roast for another 30 minutes. Chicken is done when meat thermometer inserted into the thickest part of the thigh reads 165 degrees. Remove chicken from pan and loosely cover with foil for 10 minutes to rest before carving and serving. Meanwhile, remove stuffing from pan into serving bowl. 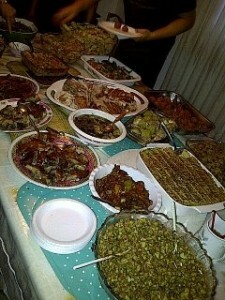 Count the 20 items at my family's Easter dinner spread. My family rules. Outsiders drool. Looks so yumm! Can’t wait to try it. Ps Love the caption under the family spread. LOL.